Hitting a vending machine that stole your money is illegal. Kansas is located in the Midwest region of the U.S. and is well known for it's vicious weather, particularly the many tornadoes that touch down in the state each year. 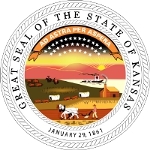 The state was named after the Kansas River which runs through the state, and that was in turn named by the Kansa tribe which was a Native American tribe. In early times far before the U.S. 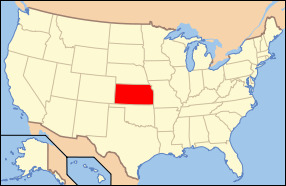 Existed, the region known as Kansas today was inhabited by many diverse Native American Tribes. The eastern part of this region was home to tribes who typically lived in villages which were constructed along the river valleys. In the western part of the region, tribes we semi-nomadic and were known to hunt bison. Kansas however was first settled by European Americans during the 1830s. During the 1850's things began to intensify during the wars over slavery. Kansas was officially opened for settlement by the government of the United States in 1854, and at that time pro-slavery settlers from the nearby state of Missouri immediately rushed into the region to dictate if Kansas would become a free or slave state. This made the region a hot point for violence during its early days when these forces collided and gave Kansas the nickname “Bleeding Kansas”. Eventually, Kansas became a free state and entered the union. When the Civil War was over the states population began to rapidly climb as immigrants began to come in waves and transformed the prairie into farm territory. Today, the state of Kansas is one of the top state in terms of agricultural productivity. High amounts of wheat, sunflowers, and sorghum and harvested in the state each year. Kansas is the ranked as the 15th most extensive state and is also the 33rd ranked state in terms of population. The state capital is Wichita and the state covers an area of roughly 82,282 square miles of land. The state nickname is the “Sunflower State” while the state song is “Home on the Range”. The state bird is the Western Meadowlark, the state animal is the Buffalo, the state flower is the Sunflower, and the state tree is the Cottonwood tree. Overall Kansas is one of the backbone states in the U.S. when it comes to agriculture, and it continues to contribute a large percentage of its land area to further help the countries agricultural system.